Did you see yesterday's survey results revealing that an average working mother gets 26 minutes per day to relax. After a month back at work, I'm lucky to get 5 minutes to myself! Sleep time isn't much better either - I only get to bed at about midnight and I'm up again at 5.45am. 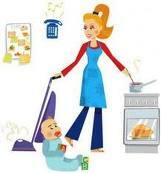 It really is a non-stop job being a mother and that's before you even start trying to keep your house looking nice. The study of 1000 women, from across the UK, found more than one third of mothers believed they have less time to themselves than their mothers did a generation earlier. The Changing Face of Motherhood report, which tracked the role of motherhood from the 1930s, was commissioned by household goods firm, P&G. Kate Fox, co-director of the Social Issues Research Centre in Bristol, said modern mothers had to put in a “double shift” every day because they had to be both a full-time worker and full-time mother. She said: “Motherhood has never been and never should be a solitary endeavour. And according to the Social Issues Research Centre, once the we become grandparents the cycle starts all over again. I'm pretty sure my mum will vouch for that one! So what else was revealed? The study’s key findings reveal that 3 out of 10 reckon they have far less “me time” than their own mothers did - barely three hours a week on average. Almost 9 out of 10 feel guilty about the amount of time they manage to spend with their kids which is 145 minutes a day on an average. But despite their heroic efforts, three in ten of the 1,000 women who participated in the study confessed to being constantly under pressure to be “the perfect mother”. What do make of these findings? How much time do you get to yourself?